Scan for ad and tracking cookies. Is there a better alternative to Cookie Stumbler (Mac and Windows License)? 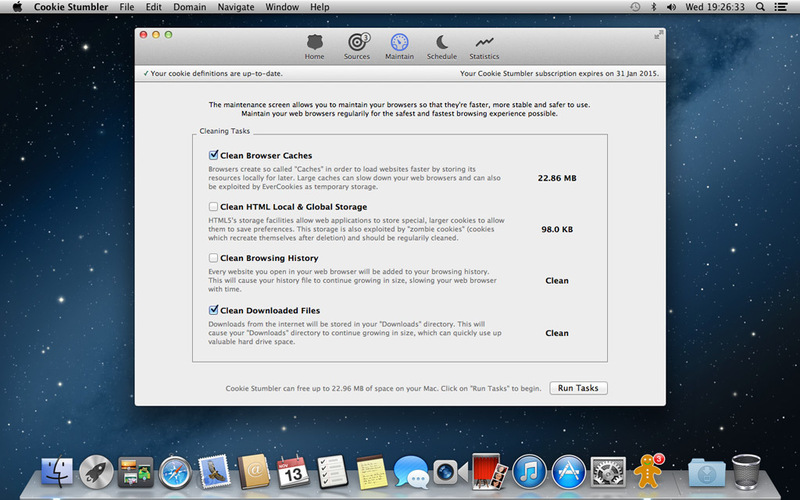 Is Cookie Stumbler (Mac and Windows License) really the best app in Internet Utilities category? Will Cookie Stumbler (Mac and Windows License) work good on macOS 10.13.4? Cookie Stumbler 2 is here. Rewritten from scratch and featuring a re-engineered heuristics engine that detects up to 6 times as many tracking cookies as its predecessor and that processes cookies up to 40 times faster, Cookie Stumbler 2 still includes all the features that you love, but takes them all a step further to make the best even better. Time Saving - Cookie Stumbler 2 quickly analyses your Mac's cookies and lets you know how many tracking cookies it has found - a task that would have taken a lot of time when going through a large amount of cookies by yourself. Cookie Stumbler (Mac and Windows License) needs a rating. Be the first to rate this app and get the discussion started! 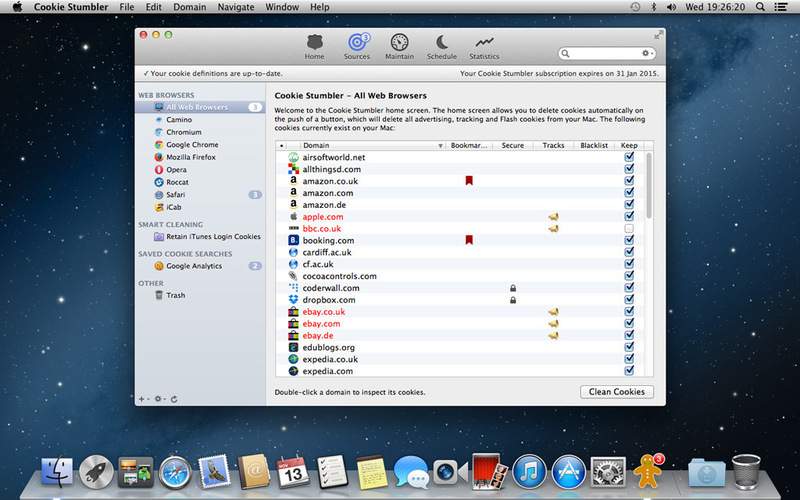 Time Saving - Cookie Stumbler 2 quickly analyses your Mac's cookies and lets you know how many tracking cookies it has found - a task that would have taken a lot of time when going through a large amount of cookies by yourself. Thanks to Cookie Stumbler's unmatched heuristics engine, you'll get a reliable, up-to-date tracking report within just a few moments, regardless of the number of cookies stored on your Mac. Private Browsing - The all-new Private Browsing mode removes tracking cookies as you browse the web, while allowing useful cookies to be stored on your Mac. This feature requires no special plugins, no special extensions and works with all web browsers that Cookie Stumbler supports. Smart Cleaning - Cookie Stumbler 2 introduces "Smart Cleaning". Rather than going through the tedious process of telling Cookie Stumbler your domain preferences one by one, Smart Cleaning allows you to achieve the same effect using a single rule. You choose the criteria and what to do with cookies that match it - Cookie Stumbler will handle the rest. Centralized control over your cookies - Rather than having to manage each Web browsers' cookies separately, Cookie Stumbler 2 consolidates them into one convenient location. And thanks to Cookie Stumbler 2's brand new categorization and search tools, this kind of a task has become simpler than ever. Compatible with major Web browsers - Cookie Stumbler 2 supports all major Web browsers out of the box, which include Safari, Firefox, Chrome, Chromium, Opera, iCab, Camino, Roccat, Adobe Flash Player, and Microsoft Silverlight. Support for additional Web browsers can be achieved using web browser plugins. Maintains your Mac - Cookie Stumbler 2 features various maintenance programs, which ensure that your Web browsers use less hard drive space, are faster, more reliable and safer to use. You can run these programs anytime by yourself or as part of a regular cookie cleaning operation.